Methamphetamine is an addictive stimulant drug. Although it has limited legitimate uses for treating obesity and narcolepsy, it is more often abused as a recreational drug. This drug has a high potential for abuse and addiction. 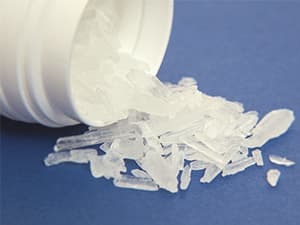 Users and family members should be aware of methamphetamine addiction symptoms, so they can spot these issues when they occur and get help promptly. In 2005, the National Survey on Drug Use and Health (NSDUH) released their crystal meth statistics. Their survey noted that 10.4 million people 12 years old and over have tried crystal meth at least once in their lifetime. With use on the rise, anyone taking this drug should be aware of what to expect during methamphetamine detox and withdrawal. If you are, or someone you love is, showing methamphetamine addiction symptoms, please call 1-888-287-0471	Who Answers? to discuss treatment options. Although many of these symptoms may also signify another kind of drug abuse or underlying mental illness, do not wait to express concern if a loved one is showing any of these signs. These symptoms, although unpleasant, are not usually life-threatening and can be managed under the supervision of a doctor. Withdrawal symptoms generally begin within 24 to 48 hours of the last use of the drug. Symptoms may last for days or weeks, depending on the length and amount of use. Because of the sometimes intense nature of withdrawal symptoms, many addicts choose to enter a methamphetamine addiction treatment program where they can have support and medical supervision during the detox and withdrawal process. “Currently, the most effective methamphetamine addiction treatment is a comprehensive program of cognitive behavioral interventions.”Currently, the most effective methamphetamine addiction treatment is a comprehensive program of cognitive behavioral interventions. A combination of individual counseling, 12-step support, family education, behavioral therapy, and encouragement of non-drug-related activities is most often employed at methamphetamine withdrawal treatment facilities. Addicts have become used to coping with their problems by using the drug. A comprehensive plan of treatment will give addicts healthy coping mechanisms to replace the previously learned ones. Proper treatment can assist the addict with ways to return to a healthy lifestyle after experiencing methamphetamine addiction symptoms. If you or a loved one would like to explore treatment options, please call 1-888-287-0471	Who Answers? today. Residential detox centers are an effective start for addiction recovery, but they must be followed with a strong rehabilitation program. With a combination of rest, daily exercise, vitamins, therapy, and healthy nutrition, addicts are taught to replace bad habits with good ones while in rehab. Users can share and learn from others with similar experiences. It is essential that users have a comprehensive plan to address the mental and physical effects of methamphetamine addiction. To explore methamphetamine detox and rehab programs, call 1-888-287-0471	Who Answers? today. Methamphetamine detox is only the first step in treating methamphetamine addiction symptoms. Without regular, long-term treatment, many users will return to abusing the drug. Treatment may be provided on an inpatient or outpatient basis. Each person is different, and having a treatment plan tailored to his or her specific situation increases the chances of a good outcome. Support groups such as Narcotics Anonymous can be helpful to some people going through a meth addiction, and supportive family and friends increase the chances of a successful recovery. According to the SAMHSA, the rate of substance abuse treatment admissions for primary methamphetamine/amphetamine abuse increased from 13 admissions per 100,000 in 1993 to 56 admissions per 100,000 in 2003, for patients ages 12 or older. There are many treatment options available that can be tailored to your specific situation. Methamphetamine addiction treatment is not something to try to do alone. Medically supervised treatment drastically increases the chances of successfully quitting the drug. For help with exploring options for treatment, please call 1-888-287-0471	Who Answers? .